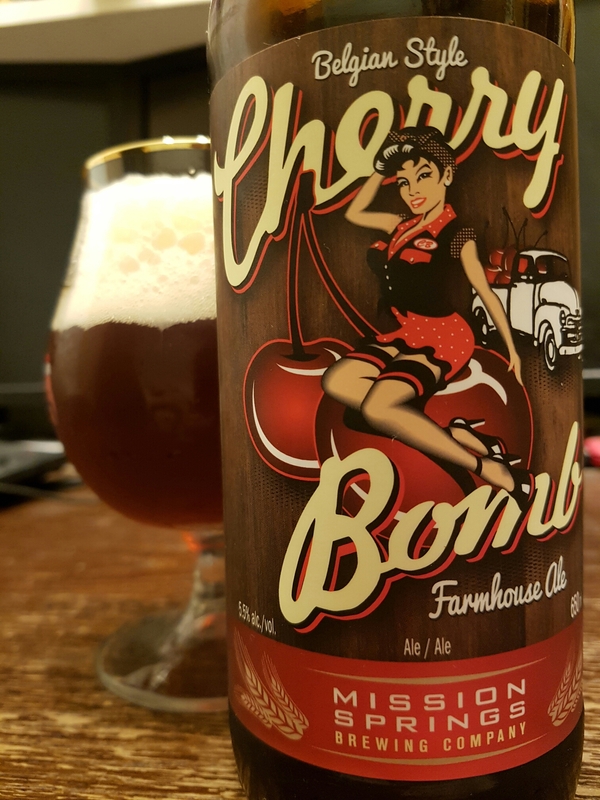 Cherry Bomb Belgian-Style Farmhouse Ale – Mission Springs Brewing Co. (Mission, BC, Canada) | Justintoxicated. Visual: Pours reddish brown with a massive super foamy head with a large 1cm retention and sticky lacing, mixed singular tight streams and clusters hugging the side of the glass. Finish: medium acidic sour, dry bitter soft astringent hops. Summary: It looks deceptively good and noses alright, but the flavours just don’t together right. Overall it there’s some astringency from the the cherry or the hops or perhaps both. At least the creamy mouthfeel and acidity are decent, but not a ton of juicy cherry flavour considering the name.